U.S. Ambassador meets with S. Korean Defense Minister. January. 29, 2019 07:52. by Sang-Ho Yun, Hyo-Ju Son ysh1005@donga.com,hjson@donga.com. Harry Harris, U.S. 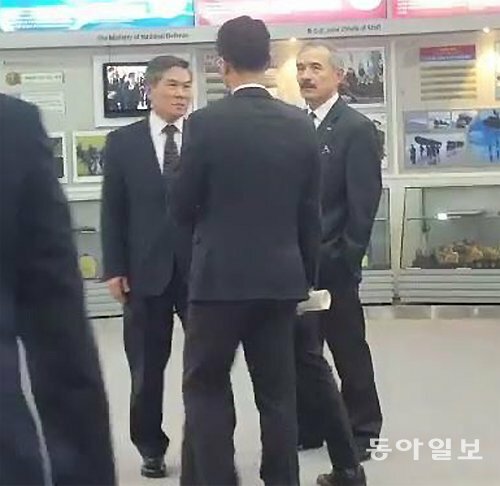 Ambassador to South Korea, visited the headquarters of the Ministry of National Defense in Seoul Monday to have a closed-door meeting with South Korea’s Defense Minister Jeong Kyeong-doo. The meeting lasted about an hour and 20 minutes, and Harris walked out of the building, saying that he was grateful for having great, constructive talks. Still, he did not comment when asked by reporters whether he discussed (with Minister Jeong) the allies’ negotiations over the Special Measures Agreement (SMA). The Defense Ministry said their meeting was largely meant for new year’s greetings, and refused to elaborate on the details of discussions. “They mainly discussed Seoul’s share of the cost of stationing U.S. troops in Korea,” one source said. The U.S. Ambassador had visited the presidential office Cheong Wa Dae on Dec. 28 to convey the U.S. government’s proposal that Seoul should pay one billion dollars (around 1.13 trillion won) every year. Yet, National Security Office Director Chung Eui-yong had opposed the deal, suggesting 999 billion won instead. The negotiations have since reached a deadlock. “As far as I know, Harris decided to meet with Minister Jeong after he was told by the South Korean side during earlier talks with Cheong Wa Dae and the Foreign Ministry that he should also get opinions from the Defense Ministry,” another source said. During Monday’s meeting, Harris reportedly stressed the importance of the Mutual Defense Treaty between the Republic of Korea and the United States of America, which serves as a legal basis for stationing troops in Korea, as well as the need to increase Seoul’s share in footing the bill, and asked for the South Korean government’s cooperation. In contrast, Jeong is known to have called for a swift settlement, emphasizing that Seoul had covered 92 percent of the entire cost (around 10 billion dollars) to establish Camp Humphreys, and that its share is not small compared with other allies. In addition, Jeong is also reported to have explained to Harris the iniquity of the Japanese warplanes’ recent low-altitude flybys and Seoul’s response measures, stressing that Japan should refrain from conducting acts that may damage bilateral relations. They might also have discussed the result of a trilateral consultative body comprised of South and North Korea, and the United Nations Command, regarding their plan to open and allow civilians to travel freely inside the Joint Security Area (JSA) in the Demilitarized Zone.